"For functional or purely decorative use, expect more from a SCULPTURESOAP." 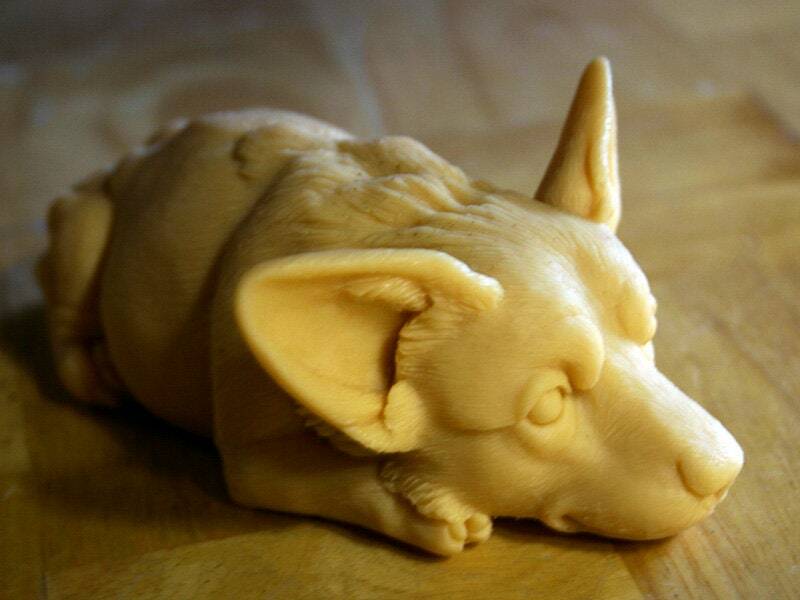 Given the full body pose of this dog, our made in Washington Corgi soap bar design is as adorable as our classic Pug Loaf. The sploot-like pose shown in this top down view is in the "Modest Gentleman" manner. Available in 5 different color and scent combinations. 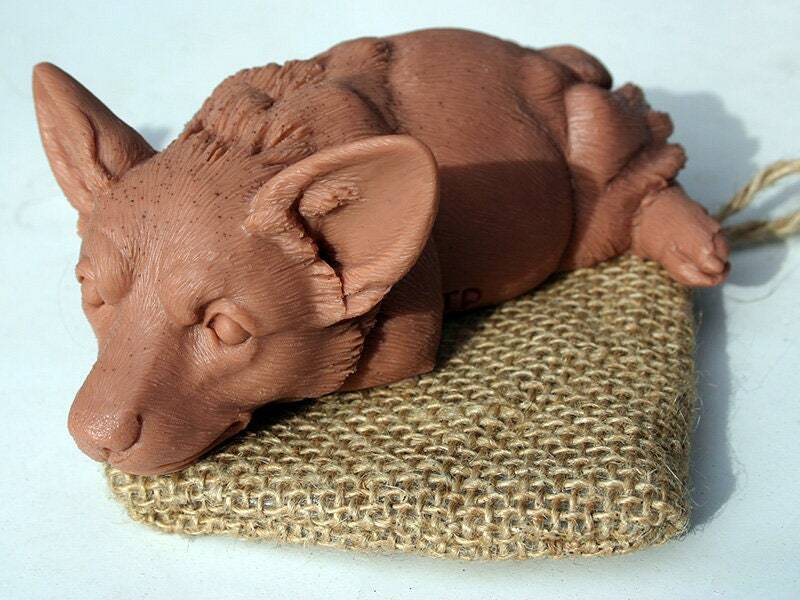 The current photo is a work-in-progress view of the actual clay sculpt. More photos will be added soon. PLEASE READ my full description before ordering this item, especially if you are using a mobile device. To insure the most unique gift giving or personal use experience, everything is custom designed and handmade. I do not acquire molds from other sources. My creative process starts with pencil sketches of each design and is refined in all three dimensions during the modeling and sculpting phase in clay. Afterwards, I create a custom cavity to capture even the most subtle impressions of my original art. My soap formula is made from vegetable oils. These natural oils make it smooth and creamy to use while nicely achieving a soothing lather. The scents and simple colors that are used compliment the intricate design. As always, use is optional with our designs. Take comfort in knowing that every Sculpturesoap has a long shelf-life. Based on customer experience and feedback, this very functional and yet decorative soap bar will last for well over 3 years if not used for washing your hands or body. Using the drop-down menu on this page, please select from the following combinations for color and scent. A cosmetic grade oxide mineral is used to achieve color. A pinch of raw organic brown sugar is used for white. * A signature craft gift box that is ready for gifting. * Each gift box has a clear window on top for product viewing. * Every Sculpturesoap is individually sealed air tight in a clear bag inside the gift box. * All ingredients are listed on the gift box. * Each gift box is stamped with the color and scent information for that item. Please Note: Because of our unique and extensive hand-made process, each bar may vary slightly in color and edge detail. Also keep in mind that at times, and as with all soap bar products, this finished product may shrink up to 15% due to moisture that is lost when not in use.